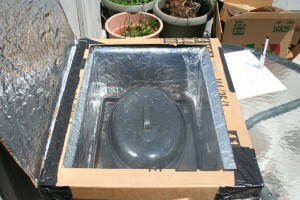 I’ve been meaning to make a solar cooker for a while and I finally got around to it yesterday. I was as sloppy as possible because I wanted to see how quickly one could be made. Even with so little care, the thing works great. I baked two potatoes on a pretty sunny and slightly windy day as a test. It took 3 hours, which isn’t that bad considering they take an hour in the oven. That time is all unattended too, so it’s more convenient than it sounds. The potatoes taste like they were baked in a normal oven, so a comparison with 10-minute microwaved potatoes doesn’t even make sense. 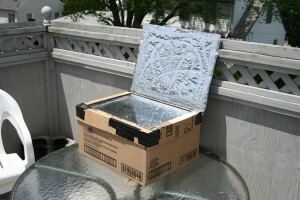 If you’re interested, solarcooking.org has all the information you could want about the topic. They have plans for making ovens – this is the one that I made. 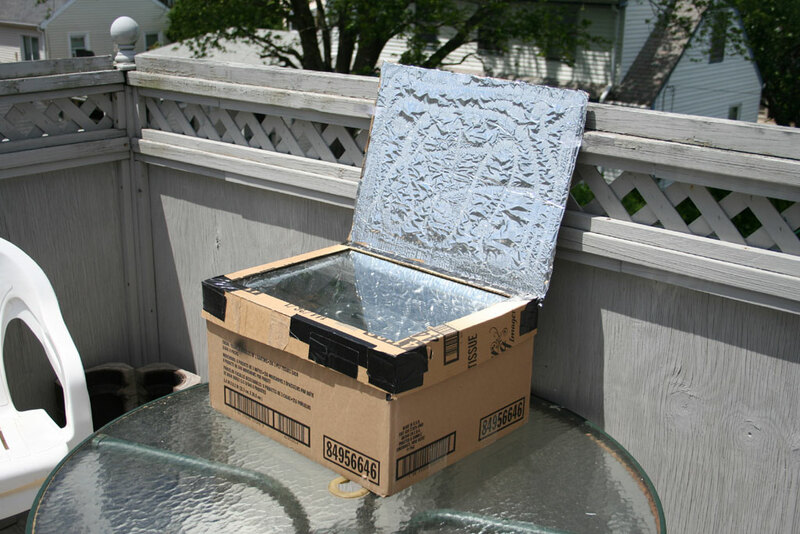 I followed all the suggestions for boosting the efficiency – I put foil covered pieces of cardboard in the space between the inner and outer boxes, I made an extra large reflector, and I used a glass top from a window I found on the side of the road instead of using a plastic film top. I didn’t have to move the oven at all (to point at the sun) during the cooking time, but I did adjust it a little here and there, just because I was out there every 30 minutes marking out a makeshift sundial. I was expecting that the position of the oven would be more important so the sundial was going to give me a way of seeing what I did wrong if I ended up with cold potatoes. No such problem. As soon as I ate the potatoes, I put in a couple more along with some whole apples with sugar, cinnamon and butter inside them. Tomorrow I’ll try rice and maybe pea soup.